Recipes for eating seasonally from your garden. What do I do with so much basil from my garden? Many of our clients have gotten a second chance crop thanks to the wonderful weather this fall. We have been enjoying lots of wonderful harvests of basil, peppers and tomatoes plus some summer squash but winter is tiptoeing toward our gardens. We are often asked, “What do we do with so much basil?” There are many ways to use your basil besides pesto but this also reminded me of some great recipes that we have been enjoying lately. 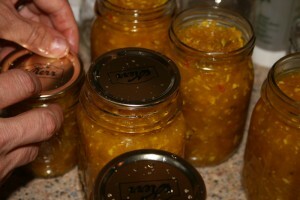 I have even added in our famous squash relish for those of you who have squash. Chop the tomatoes and peppers very finely. Either by hand or in small batches in a food processor. I diced up all my veggies only because I like a chunkier relish. Put the chopped vegetables in a large pot (heavy bottom non reactive pot) add the mustard seed, celery seed, vinegar, kosher salt and sugar. Stir well and bring to a simmer over medium heat. Cook stirring often and skimming as needed. ( I did not have to skim off anything) Simmer until the relish/chow chow cooks down and thickens into a relish, about 2 hours. Turn into hot sterilized jars and process in a hot water bath. Chop up above ingredients in food processor (diced). Spread on 13 in by 9 in baking pan (with sides) and sprinkle with 3 Tablespoons of salt. Let the diced veggies set over night. Rinse in 2 cold water rinses. Place in a large pot and add 4 and 1/2 cups of sugar, 2 and 1/2 cups vinegar, 2 Tablespoons turmeric, 1/2 teaspoon nutmeg, 1/2 tsp black pepper and 1 and 1/2 teaspoon celery seed. Cook for 20 minutes. Pour into 1 pint canning jars and seal. Process in water bath 10 minutes. Makes a 1 pound loaf. Add ingredients to machine according to manufacturer’s directions. The end of May marked the transition from Spring to Summer here in central Texas. It is now early June, and gardeners are enjoying their first Summer harvests of beans, tomatoes, cucumbers, and summer squash. But how is a gardener to know the right time to harvest? Being either overly eager or too hesitant can result in disappointment. Here is a look at what we’re harvesting at Bohemian Bounty, and a few tips on how to tell if your own bounty is ready for the table. 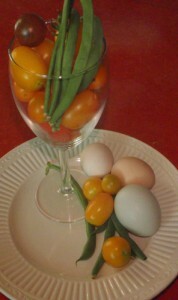 These lovely eggs are from the Bohemian homestead. The brown and cream eggs were collected from our Silkies, and the pale blue egg was laid by one of the Ameraucanas. If left outside, eggs will keep for two days, however, this can attract unwanted visitors to your hen house – rat snakes, opossums, and raccoons to name a few. Refrigerated eggs will keep for up to two months, but once refrigerated, they must be kept cold. Most of the tomatoes in the photo are tricolor cherries from Renee’s Garden, but the Black Cherry tomato in the upper left is from Baker Creek Heirloom Seeds. Typically it is obvious when a tomato is ripe, as it transitions from green to red, but heirloom and uncommon varieties can be more difficult to judge. The tricolor cherries are ready for harvesting as soon as they are no longer green, but the black cherry tomatoes go from green to a very dark red, which may look over-ripe to the unfamiliar eye. When tomatoes are ready for harvesting, just pop them right off the vine! But be sure to store them at room temperature, away from direct sunlight. Being stored in the refrigerator (or anywhere at temperatures below 54 degrees) causes their flavor and color to deteriorate. On the other hand, too much sunlight or heat will cause them to over-ripen and decay. The beans shown are Tendergreen pole beans from Burpee. These beans are ready for harvesting when they are about 3-4 inches in length, yet still tender enough that you cannot feel the beans through the pod. Pick them by pinching them off right at the top where the bean meets the vine. Right now the Bohemians are pickling cucumbers. These cucumbers are the Endeavor from Renee’s Garden. These produce quickly and abundantly. When harvesting, snap below the stem, as close to the cucumber as possible. Be sure to pop off the dried flower remnants! In this shot, the pickling cucumbers share their jar with Texas A&M’s “1015” onions. 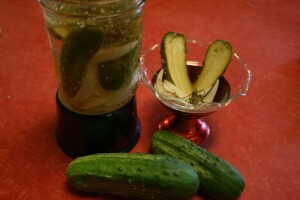 Making “refrigerator pickles” is a good way to preserve cucumbers in small amounts. This link takes you to a great starter recipe at epicurious.com. This is the recipe we used, but with two small alterations. First, we reduced the amount of sugar called for by 1/2 cup, with marvelous results. Second, instead of using a mortar and pestle to crush the pickling spices, we re-purposed a hand-held pepper grinder, which worked very well. We adjusted the amount of spices to 1/4 of what the recipe called for. Spices are the one personal touch that can make your recipe stand out – other suggested spices to add to the mix are cardamom, celery seed, basil, bay leaf, orange leaf, and cloves. Have fun! If canning has always interested you as the best way to preserve your garden’s bounty, but you were too intimidated to dive in, be sure to check out Bohemian Bounty’s canning workshop on June 20, 2009. We’ll get you started making your own pickled cucumbers, green beans, okra, as well as jams, jellies, and sauces.